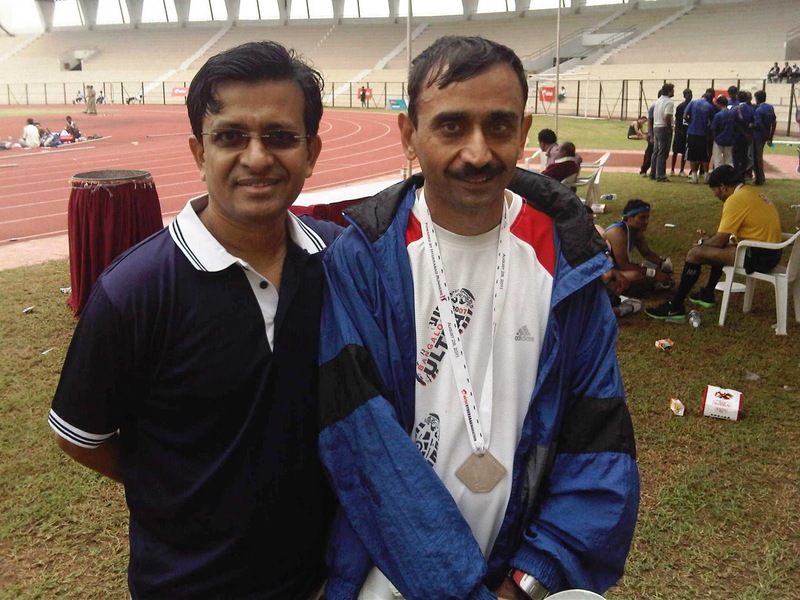 Though I managed a PB time of 3:51:48 beating my previous PB at SCMM 2011 by exactly a minute and finishing 1st in the senior men's category (all winners here) I was disappointed with the race. I had trained for over 10 weeks using the FIRST 'Run Less,Run Faster' program with a target of going sub 3:40 or at least sub 3:45. Except for the last 2 weeks I had some excellent training runs specially the tempo and long runs - though the interval runs were a struggle. I got to the half-way point on target at 1:46 and the 30K at 2:37 as planned. However, after that things went downhill. Both my glutes started to hurt and around the 34K mark I suffered from cramps in both the quads and feet. However, I hung on despite the average pace dipping rapidly specially between 35K and 39K. It was during this stretch in the Hyderabad University that fellow runenr Kumar who had stopped due to cramps passed by in a pickup vehicle and asked if I wanted to get in. Despite the pain that the thought of givving up never crossed my mind. By the 35K mark I realised that 3:45 was not going to be possible so my focus was to try and do a sub 3:50. However, soon even that slipped away and I had to push hard in the last 2Kms including sprinting into the stadium to go just below my previous PB time ! See the official split timings here and detailed analysis from my Garmin data here. I am unable to figure out why I cramped in both the legs. I had hydrated well before and during the race, taken adequate rest and was not using a new pair of shoes. Infact the weather was very nice - mostly cloudy and temperature in the low 20s celsius. Perhaps , the couple of Kgs that I had put on since January made a difference or for the type of course I ran too fast in the first 30Kms. That is , my legs (and glutes) did not have the strength to handle the pace across 3 flyovers and numerous fairly steady and long gradients. See here for the route description. An additional challenge was strong headwinds at times. I have not been doing any strengthening since January 2011 when I discontinued the sessions at the Manipal Hospital Department of Sports and Excercise medicine. The niggle in my left glutes and left calf continued to linger on several weeks after the run - so I need to start strengthening excercises soon. That and sustained interval training is probably key to be able to sustain the desired pace for a longer period of time specially towards the end of the race. 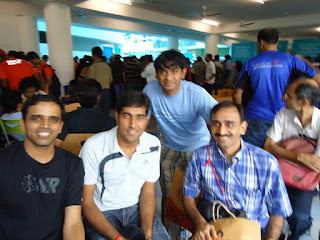 As always met with several friends and also my brother Mahesh at the end of the race and took a few pictures. Several friends from Bangalore had podium finishes - Ashok, Neera, Vaishali..and the awards were given away by the governor of AP. I myself missed the opportunity to go upto the podium to receive my plaque as the winner of men's veteran category as I was busy catching up with ex-colleagues Nathan(see picture below), Mathivanan and my brother Mahesh. Overall, the event was well organised. For most part the traffic was well managed - there were a few small stretches where we had to run with traffic. The Km markers and turns could have been marked better. Also, in a few other places the volunteers were not attentive enough and one had to ask for directions. I also heard that the aid stations did not have the spray which many runners required inorder to get temporary relief from their pain and cramps. Apart from this ofcourse the delay in the bib distribution commencement the previous day was an irritant that should be avoided. Nevetheless, on the positive side it gave an opportunity for runners to hang around longer and mingle and catch up each other and take some pictures - see below. 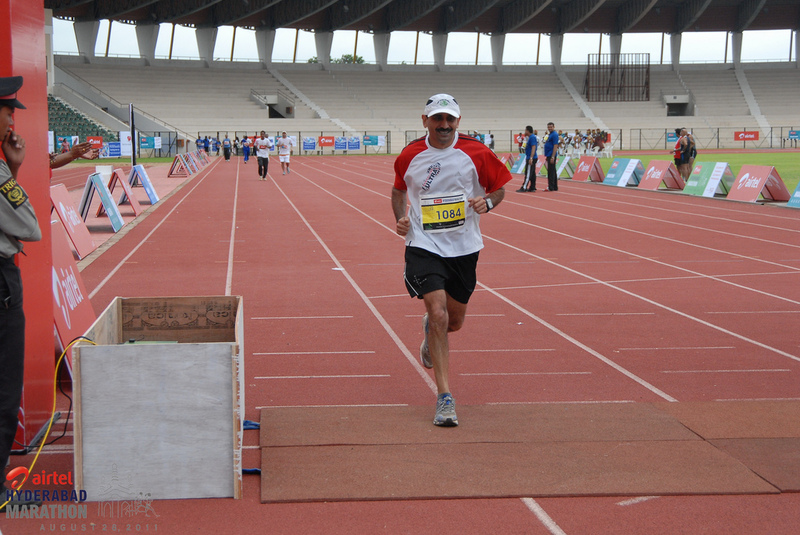 The major put-off for most runners was the 24 minutes delay in the start of the race possibly due to the chief guest arriving late. 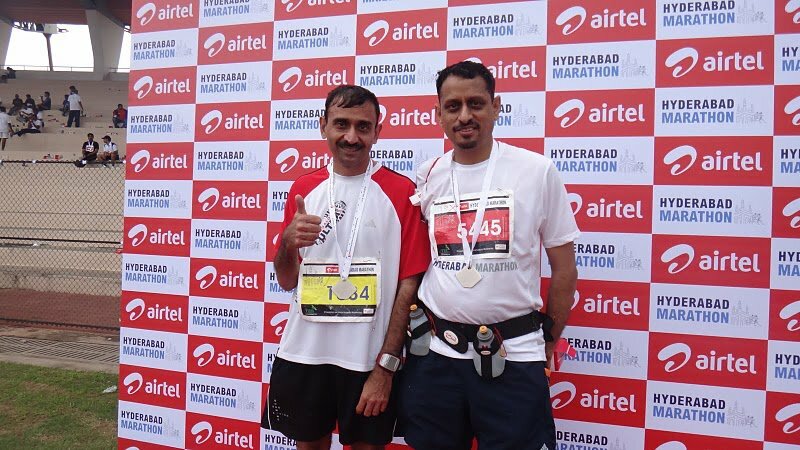 Nevertheless, the overall race experience was very nice and I am sure Hyderabad Runners will ensure that the event improves year after year. 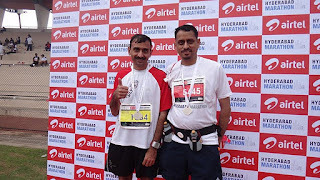 On race morning I left Domalguda at 4:20am by cab and reached the start point at people's plaza in about 15 minutes with ample time to check in my bag, warm up and exchange banter with other runners. The 24 minutes delay in the start of the race made the runners quite restless. When the race did begin I had night-marish ﻿start - within a minute or two I felt my timing chip come-off my shoe. This was one of the rare times where I had used only the plastic tag and not a shoelace to tie the chip and I seem to have done a shoddy job with the tag(a lesson learnt ofcourse!). As soon as I realised this I stopped and turned around to walk back a few steps and pickup the chip causing a minor panic amongst the runners directly behind me including Neera. I put the chip in my pocket and ran a short distance mulling over what had happened and what I should do next. Fortunately, I got the idea of stopping on the side and tying the tag via a shoelace which I did. Around that time I started to run with Sundar from Chennai Runners. 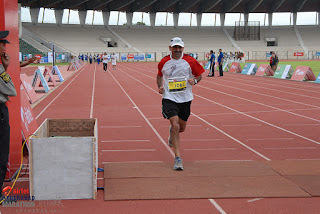 We ran together for about a Km or so after which he took off and finished in an amazing timing of 3:33:04. After that I ran most of the race by myself. At around the 14 Km mark after the Khairatabad flyover in the gradients of Banjara Hills I saw Nitin waiting for Neera to come by. Upto about the half-way mark I was just behind Siddhartha Menon - at this point I was doing quite well- hitting the mark within my target time of 1:47. But soon after he too took off or rather I dropped off as he seems to have run a steady pace to complete in 3:35:55. Though Rajesh Vetcha went by in a crew vehicle shouting that the gradients were all but over that was not all true. I found that even the stretch inside the university, though very green, was not flat. And as mentioned in the first paragraph above the last 7-8 Kms was quite a struggle. After crossing the finish line I took the help of Mahesh and collected my bag - this was my first experience of a point to point race and a baggage bus in India and it worked without a hitch. 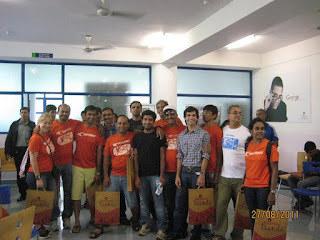 And then met with fellow runners and other friends. What has been your experience with the Run Less, Faster program? I am planning to start that from next week and am going to be in Bangalore this weekend for the sessions at Manipal. Can we meet up? Would love to run with you on Sunday - need to do 17k acdg to Hal Higdon. Do email - ajay at tripnaksha dot com.